Located right next door to Minneapolis is the suburb of Edina, which Mpls.St. Paul Magazine called “boutique chic in the suburbs.” Home to upscale shopping districts including the highly popular 50th & France neighborhood, dozens of restaurants, and numerous indoor or outdoor activities, this high-end suburb is a great place for a weekend get away with your family. Putt 18-holes, enjoy swimming indoors, year-round, or attend the Edina Art Fair—going strong for more than 50 years. 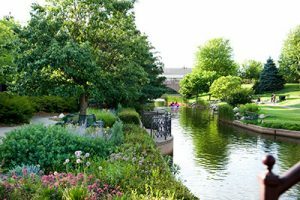 Here are the top things to do with your family in Edina, Minnesota, this summer. At Centennial Lakes Park, the 18-hole putting golf course is the most popular family activity. The 1,662-foot-long, par-51 course only accommodates putters. “It’s really geared to any age group,” says Laura Knollmaier, assistant park manager. “Everybody can do it and be a little competitive. But it’s rivaled pretty closely by paddleboats.” These boats travel amid 24 acres of water features. Fishing enthusiasts can borrow rods or purchase bait corn at the clubhouse as well. You can rent equipment for championship-caliber croquet and lawn bowling, or hike 1.5 miles of paved paths, too. Summer activities include a Thursday Farmers Market, weekday concerts for preschoolers, and family-friendly Thursday night movies. “[Centennial Lakes Park is] very unique to this area and has a lot for families to do,” Knollmaier says. Plenty of outdoor sculptures here are just a small sample of public art scattered throughout the city, too. With its pirate-themed outdoor waterpark and a children’s pool featuring multiple slides, sprays, and fountains, Edina Aquatic Center has long been a family favorite inside Rosland Park. (It has full concessions, too.) The Olympic-sized step-in pool offers one- and three-meter diving boards and lap swimming lanes. 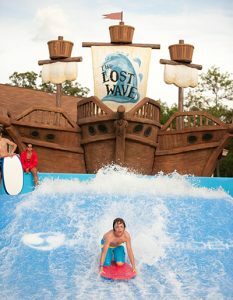 Kids of all ages will enjoy The Lost Wave, a surf simulator that allows visitors to catch a big wave in a safe environment. The Shipwreck Express is a cable ride that resembles a ship’s bow, starts at a 10-foot platform, and includes a trapeze bar. Oakwood Forest features a treehouse-themed playground with a life-sized giraffe and a hippo, as well as a rope ‘spider web’ and monkey bars. 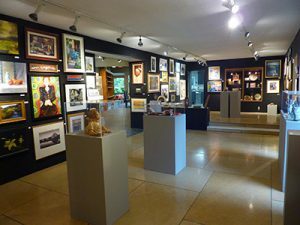 A place to ‘enjoy art and learn how to create it,’ Edina Art Center is another family-friendly stop. The gallery showcases solo and group exhibitions such as Art for the Garden (May 12-June 16), with pottery, metal art, paintings, clothing and more, inspired by flora and fauna. Open July 14-September 14, the upcoming Over the Sofa exhibition features ‘over the sofa’ art collected by local residents that include a business owner, a doctor, a waitress, a lifeguard and others. Classrooms, an art supply store, a pottery department and studios for rent are part of the center, and you’ll find original art for sale inside the gift shop. Full of lush plantings and always 70 degrees, Edinborough Park is Minnesota’s premier, completely enclosed public recreation facility. The one-acre park offers free music, dance, theater and visual arts programs inside a 250-seat amphitheater, including a spring 2016 Gardening Series. 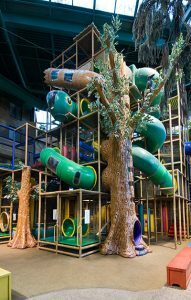 Children love exploring one of the nation’s largest indoor play structures, while adults enjoy the 82-degree, Junior Olympic-size swimming pool. You’ll find a 1/16-mile, three-lane track with walking, jogging and running lanes; and a variety of cardio and strength equipment as well. After working up an appetite, Peak Cafe is a great place to savor a slice of pizza or banana bread or a healthy fruit smoothie. Daily admission is $12 plus tax; admission packages and annual memberships are available too. Connected to Edinborough Park is the Residence Inn by Marriott Minneapolis Edina, a family-friendly hotel in the heart of the action (within minutes from Mall of America). “This property is a unique, convenient place for families to lodge,” says Shelly Loberg, director for Explore Edina. “Suite-style rooms, full, hot breakfast and access to Edinborough Park and its amenities make it a fun experience.” Families also will love the Olympic-sized, indoor swimming pool and a running track, and that complimentary breakfast has delicious options like scrambled eggs, hash browns, muffins, waffles and home fries. Open beside Centennial Lake since 2011, Pinstripes is a unique place to bowl or play a game of bocce ball with family and friends. Plush seating and game-side food and beverage service make this a cozy and tasty experience. You can enjoy made-from-scratch Italian/American cuisine that’s even good enough for upscale wine dinners or wedding receptions held on-site. There are kid-friendly fried mozzarella plates and pizza as well as parent-pleasing sandwiches, salads, soups, or house-made pastas, including gnocchi with Ahi tuna. Entertain yourselves for less than $20 per person, and enjoy a tasty meal while you play. 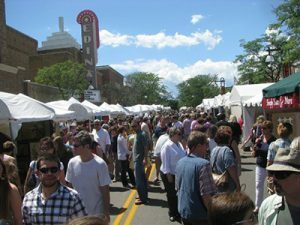 For more than 50 years, Edina Art Fair has been proudly showing off local talents. With pieces crafted by 280 fine artists from Minnesota, the U.S and Canada, plus food and beverage vendors, the event is considered Minnesota’s No. 1 art fair—and one of the best in the nation. “We get over 200,000 people per year coming to the art fair. During the fair, the whole 50th and France neighborhood is really involved in promoting and welcoming people,” says Loberg. Food trucks, craft beer and wine gardens will entertain the adults while youngsters can enjoy their own designated spot in the Kids Zone, which has music, a magic show, a bouncy house and more. A Youth Booth will showcase art created by children from age 8 to 18. “We are excited to have 12 of our youth from the community featuring art this year,” says Rachel Theleman, executive director of the 50th and France Business and Professional Association that plans the Edina Art Fair. “The art fair will not only feature art but it also has fun art and other activities for the kids and great food and craft beer throughout the weekend,” she adds. You can stay updated about fair events and activities on Facebook. Perhaps one of the most charming Minneapolis-area shopping neighborhoods is 50th & France (France Avenue South and West 50th Street), home of the Edina Art Fair. It’s a great place to find a wide variety of fashions, high-end kitchen gear and home design inspiration. In warm weather, savor Tuscan-style pizza or kid-friendly waffles at patio tables that line the sidewalks. Luxury brands such as Coach, and independent boutiques featuring clothing, decor, and gifts characterize The Galleria. Robert Redford’s, Sundance showcases ethnic and rustic textiles, clothing, and furniture; while children love Creative Kidstuff, where toys educate and stimulate creativity. 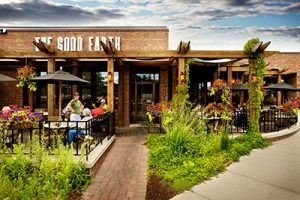 Fresh smoothies and French toast are breakfast favorites at The Good Earth. The nation’s first indoor, climate-controlled shopping destination, Southdale Shopping Center opened in 1956. It appeared in the documentary “10 Buildings That Changed America,” largely because of its courtyard, with goldfish pond, bird aviary and sculptures. You’ll find Macy’s and J. Crew here, alongside ethnic and American-inspired restaurants. You’ll also find Dave and Busters, home to hundreds of state-of-the-art games. 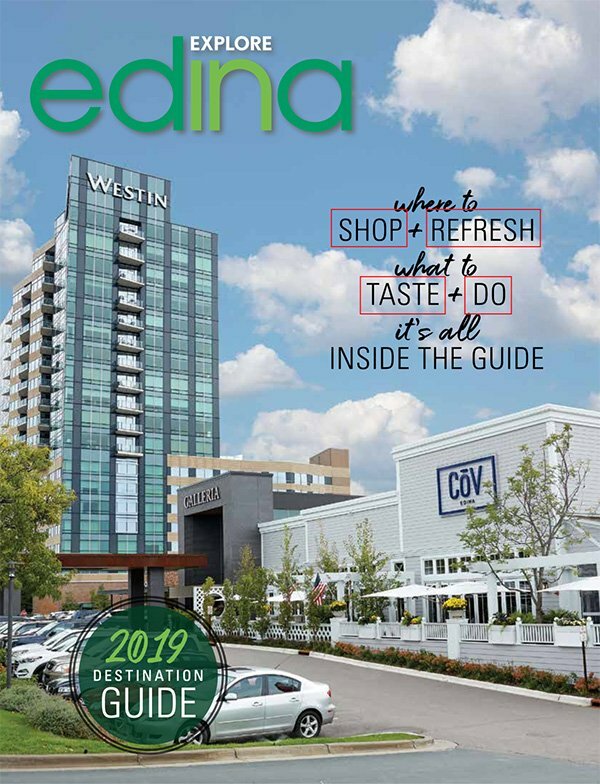 Whether you want to play indoors or outdoors, shop ‘til you drop, or explore Edina’s artistic offerings, your family will long remember their weekend in this lovely city.